I was associated with Koolaree back in the 1950s. Specifically I was a Junior Boys Camper 1950 to 1952, Senior Boys camper 1953 to 1955, Junior boys Cabin Leader 1955, member of the Owls of Laska camp fraternity starting in 1953 and an active worker at many work party camps from 1953 to 1958. The first session: each season was a 10-day Senior Boys Camp (age 13 to 16 but generally topped out at age 15). Next came Junior boys for age 10 to 12. Following this came three Girls sessions—Senior, Intermediate and Junior (and that is really all I know about the girls camps) and finally a Coed session for age 17 and 18. The Fraternity (Frat) camp was held Labour Day weekend. 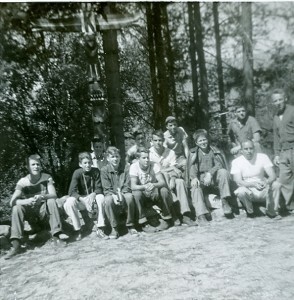 In their first year at Senior Boys camp 13 year olds were assessed by their peers who were already in the Frat and, if it was determined that their dedication to the Camp was strong enough, they were invited to join the Frat. Note: only boys were members. On Labour Day weekend they would go through a silly and harmless initiation and become Owls. 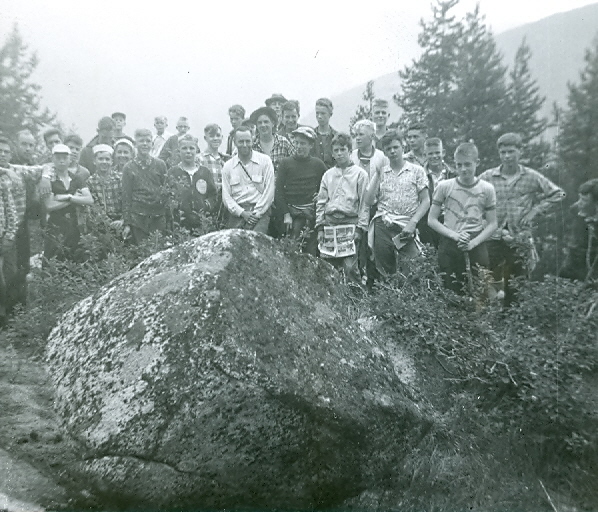 The Frat was named for Mount Laska which is directly behind the camp. I was one who joined at 13; others joined at 14 or even 15. It was not a fun-and-games group. It was primarily a volunteer work force. The Frat’s role was to winterize the Camp by storing bunk beds, mattresses, etc away for the winter, disconnecting the water supply, draining toilets, doing necessary repairs and painting, etc. 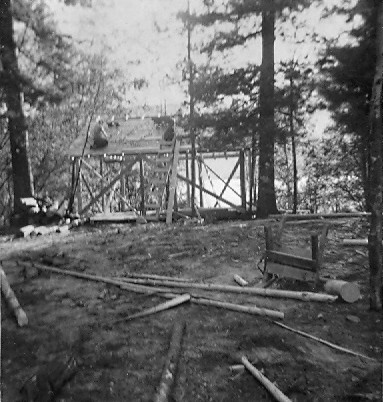 Most of this would get done Labour Day but a follow up “work party” took place on Thanksgiving weekend when work was finalized and wood was chopped for use in the kitchen stoves the following summer. 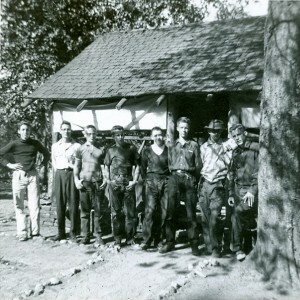 (Yes 13, 14 and 15 year olds were actually using chain saws and double-bitted axes, it was a different world then). Around Easter a group would go to check how things wintered and determine if any repairs were required. On Victoria Day weekend there would be a major-sized work party go to Camp to prepare the cabins, lodge, kitchen, first aid quarters etc for the summer. The Easter trips usually did not include “adult” supervisors, just 17 and 18 year old Frat members. Those of us in the Frat were the guys who wanted to spend as much time as possible at Camp and to do whatever we could to make it a memorable occurence for campers. I should mention that Frat members who were attending Senior Boys camp were the cadre from which junior counsellors and cabin leaders (supervisors and mentors) were selected for Junior Boys camp. 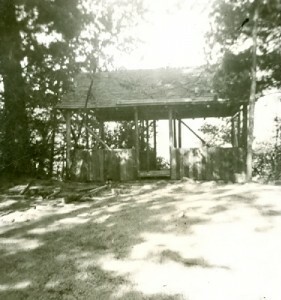 During Senior Boys camp in 1953 not all cabins were in use. We were awakened in the middle of the night one night by unexpected blowing of a CP train whistle. The engineer was trying to draw our attention to the fact that one of the unoccupied cabins was on fire — it went up like a torch despite bucket brigade activities. Frat members attending that camp worked at clearing the mess and rebuilding the cabin as it was needed for Junior boys camp. I apologize for the quality but remember it is 1950s technology. They are all in black and white in old formats (mine are 620 film which means pics are about 2 inches square).